The Ghana Flag was adopted in 1957 and consists of three horizontal bands in the colors of red, gold, and green. In the center of the gold band, there is a 5-pointed black star. 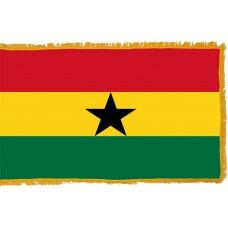 The Ghana flag was created by Theodosia Okoh and was the second African flag to feature those colors. The red color represents the battle for independence from Great Britain and the blood and lives lost. The gold color represents the country's natural wealth and the green color represents the lush forests within the country. The black star is symbolic of the country's independence and liberty and the fact that it was a free black nation. 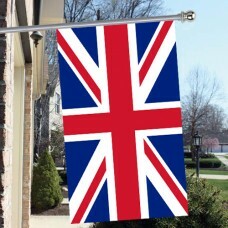 The flag is symbolic of the 500-year struggle for independence that was endured. The Ghana flag was first raised on March 6th, 1957 and was used until 1962 and re adopted once again in 1966. Ghana was formerly known as the "Gold Coast" due to its large production and availability of gold. It is the second largest producer in Africa of gold. The amount of gold produced caused much conflict between Great Britain and Portugal. The Gold Coast was first noticed in 1470 by Portuguese traders, who were the first to build a settlement in the country in 1482 and begin trading. After the Portuguese and the success, many traders came to the country which included the British, Dutch, Prussian, and Swedish and in 1867, the Gold Coast became part of the British Colony. In 1874, it became a British Protectorate. During the period that the Gold Coast was a British Protectorate, following World War II, it was the richest country in West Africa. The flag that was used for the Gold Coast when it was part of the British Colony and a Protectorate was a dark blue field with the Union Jack flag in the top left corner and on the right-hand side of the flag was a disc, which featured an elephant inside it in front of a palm tree and mountains. 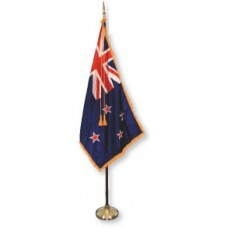 This flag was used from 1867 until independence in 1957. When the Gold Coast gained independence, the country name was changed to Ghana, which translates as "Warrior King" and it was the first country in West Africa to gain independence. Ghana is a country that is located in West Africa and shares borders with the Ivory Coast, Togo, Burkina Faso and the Gulf of Guinea. The capital city of Ghana is called Accra. Ghana is home to many beautiful historic sites and is proving to be a popular tourist destination. The most popular sights and attractions in Ghana include, the "Elmina Castle" which was built in 1482 by the Portuguese and is the oldest building in the country. Another castle that is popular amongst tourists is the "Cape Coast Castle," which used to be one of the "slave castles." Ghana is also home to "Lake Volta" which is the largest artificial lake in the world and to the "Wli Waterfalls" which are the highest waterfalls in Africa.